Dandruff is the excessive flaking of dead skin cells from the scalp. 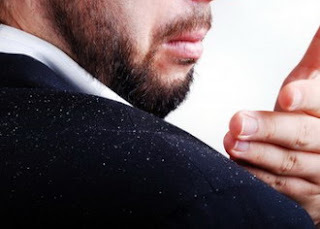 Dandruff is not an organism like lice, but just dead skin that accumulates in the scalp. dead Skin cells and flake is common and normal. But in some people it becomes excessive. When accompanied by redness and Irritation, then dandruff can be a symptom of seborrhoeic dermatitis or psoriasis. Oily skin. Many people believe that dandruff is caused by dry scalp. However, dandruff is also found in oily scalp. Layers of excess oil on the scalp can dry out, thicken and become debris in the form of dandruff. Sweat. If you exercise regularly, you sweat more, which can also cause dandruff, especially if you do not wash as often as they should. Fungi. Certain forms of dandruff are also believed to be caused by a fungus on the scalp. Because the fungus can not be eliminated completely the dandruff also not be exterminated, can only be controlled. Vinegar and water: vinegar is an excellent remedy for dandruff, because the potassium and enzymes in vinegar can help eliminate dandruff and itching on the scalp. Mix a cup of vinegar with a cup of water. After shampooing, apply on the scalp, then let a few moments. Then, rinse your hair with clean water and the result is you feel after treatment for two weeks. Aloe Vera: pour, extracts of aloe vera on the head, let sit and wash after 15 minutes. After several treatments, dandruff on the head will be lost. Salt: Sprinkle and rub the scalp with salt to taste. Rinse after a while and wash your hair with shampoo. Lime and Lemon juice: pour 2 tablespoons lime juice in the head, then massage the hair and scalp. Take a glass of water and add 1 tablespoon of lemon juice into it, then pour into the hair. Rinse with water after a few minutes, the head will smell nice and fresh, Repeat several times until the dandruff is completely gone. Mouth Fresheners: the content of antibacterial mouthwash handy enough to eliminate dandruff and itching on the scalp. Combine mouthwash with water and shampoo. Wash as usual while massaging the scalp with your fingers to increase circulation to the hair cuticle. Regular maintenance will repel bacteria and dandruff. Keeping your hair and scalp clean is very important if you want to eliminate dandruff. Many brands of shampoo to treat dandruff, but make sure you choose a shampoo that contains Zinc Pyrithione, Tea-tree Oil, Green Tea, and ketoconazole. Shampooing regularly is a good habit. Cleanse the scalp regularly to prevent the accumulation of dead skin cells on the hair and scalp. Wash your hair at least two or three times a week. Use herbal shampoo and dandruff shampoo treatment for better results. Use a good conditioner is on the hair and not the scalp. Be sure to wash clean the rest of conditioner in your hair because if left to worsen the already problematic hair conditions. Comb your hair regularly. It's a great way to ward off dandruff and dead cells from your scalp. Combing hair dandruff is also able to drive to a certain extent. Vitamin B can actively control dandruff. High consumption of green vegetables, eggs, and protein because it can strengthen the hair and also prevents dandruff reappears. Apply a mixture of lemon and a few drops of mustard oil on the scalp, massage gently and let stand for one hour. Then rinse with clean water. This is an effective medicine to control dandruff.